Add a touch of the outdoors to your home with this deer accent pillow. 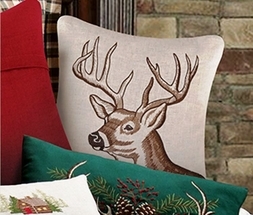 Featuring a majestic buck embroidered in brown that provides dimension on a linen-colored background. Makes a great gift! Filler insert included.